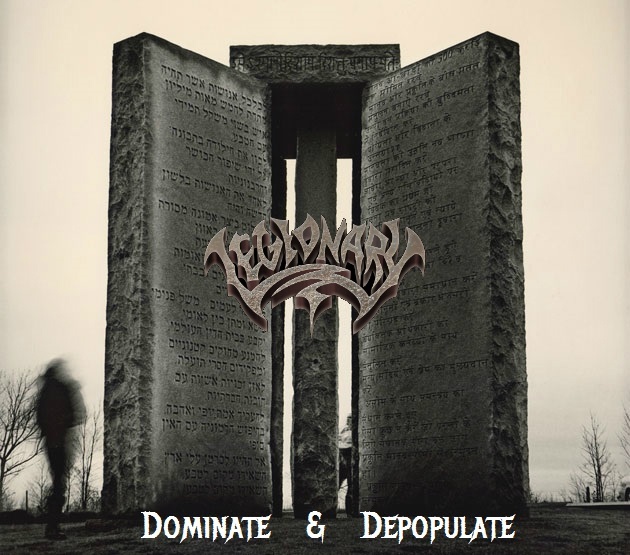 Legionary is a death/thrash project headed by Frank D’Erasmo. For quite some time Legionary were a touring band, but for all intents and purposes it is now Frank’s solo project. For this EP, Frank has assembled a team of Bronx/New Jersey musicians to produce this masterpiece of uncompromising ferocity. Frank writes all the music including lyrics and plays drums on this EP. Tony Barhoum handles lead guitar duties, Bobby Torres is on rhythm guitar, Mike Dreher on bass and Johnny Gierak on vocals. On first impression I am simply blown away by the quality of the performance and songwriting. These guys all mean business. The music to me is a mix of some of the best thrash / death outfits I’ve listened to. I’d probably describe them as the cross between Death and Arch Enemy, with a pinch of old school Master thrown in for good taste. The “Dominate and Depopulate” EP in essence consists of 4 songs, three of which repeat later on as instrumentals. I am not exactly clear on why this came about, but for the purposes of this review I’d treat it as a four song EP. Note: Frank explained that he always gets asked for the instrumentals so he prefers to release these with the EP. This release grabs you by the jugular from the intro “The Time To Choose Sides Has Come” and kicks you around for the duration of the EP, with never a dull moment. The opener showcases the band’s musicality, with some cool bass melodies…yes, that’s right, there’s an outstanding bass solo on this one that is mixed right! The guitar lead phrases would make even some of the metal greats take note. “Premeditated Civil War” continues along the same note, with a solid thrash tempo, and on this one the vocals kick in with equal ferocity. The listener gets a taste for the band’s ability to turn a riff around and play with timing and accents that hint at world class musicianship. It is also a very serious headbanging track that should manage to keep moshpits churning. The lead work that merges towards the end of the song into several layers of guitar harmony reminds me of some of the finest Arch Enemy moments. “Shall Not Be Infringed” continues the EP in a more mid tempo style which offers the possibility for the band to add a few more melodic nuances into their sound. This one actually felt like an instrumental until vocals kicked briefly in mid-song around 1:50 mark. On this track there are also some amazing short stops and timing changes that hint at the band’s tremendous musical potential. “Global Depopulation Agenda”, the EP closer, merges approaches from the previous two songs, adding some speed and tempo changes, delivering again some amazing lead breaks and breakneck stops. On the production side, I’d have to say that this band sounds and feels ready for the prime time. If I’m hard pressed to criticize an element, it would be the lyrical content. Not that there is anything wrong with the thematic content, which is quite metal (government conspiracy, Illuminati, NWO), but I feel that they could use a bit more depth in the lyrical department. As far as I am concerned, and I hardly say this for the bands that I review, these guys should have been signed yesterday! Great job Legionary – you earn top spot in our “Featured Music” column!